Murrow was a radio and television broadcaster-journalist, whose radio reports of key European events preceding World War II and of World War II itself (especially the Battle of Britain) were not only broadcasting landmarks, but helped shape America’s attitude toward the Axis and the Allies. 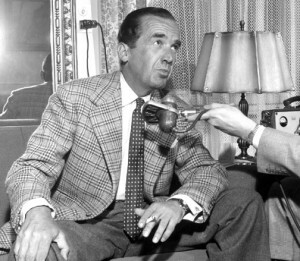 Murrow became a pioneer of television news during the infancy of the medium, inaugurating a highly respected weekly news digest called See it Now. During the early 1950s, Murrow’s television broadcasts were instrumental in exposing the reckless demagoguery of anti-Communist witch hunter Senator Joseph McCarthy and did much to bring about the end of the infamous McCarthy era. Murrow became an enduring model for journalists in the age of electronic media.